I’ve been reading Glenn Beck’s book, Arguing With Idiots, and I always seem to get stuck on the Education chapter. I get sick to my stomach reading about the so-called “progressive education” system. One thing in particular that’s really got me livid is the whole “red pen” debacle. Soon kids will associate purple with being “harsh” if you think about it. Red, they say, is damaging to a child’s self-esteem. 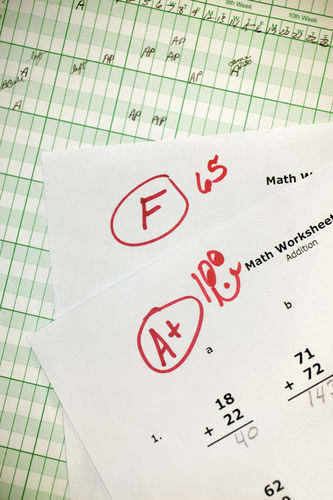 I don’t know about anyone else, but when I was a child and I received papers my teacher graded and they had any red “x’s” on them (mainly in math! ), it motivated me to not want any red “x’s” the next time I handed in a test or homework; it made me want to study more and try harder! I loved getting a paper back from my teachers with a big red “A” and a smiley face or even a sticker on it. What is happening to our education system? This is just one of the many reasons that most of these children, once grown and in the real world, will find it hard to deal with any form of failure. I know some young adults who were raised and groomed with this sentiment who are having a very hard time adjusting; not everyone is on equal ground and not privy to the same privileges of those that work their asses off to garner the spoils. What will the schools do away with next; the entire letter grading system, so that kids aren’t hurt by a D or F on their report cards? Honestly, in my opinion, the education system is becoming too politically correct with mandates. Some school systems have even eliminated Valedictorian and Salutatorian from high school graduation, so others aren’t made to feel bad they didn’t achieve such an honor. What about the hard work, studying and dedication that those students put in during their high school years? They deserve that recognition! Why aren’t more people taking a stand against the direction our education system is going? These days, it seems to me that teachers are becoming servants of the federal government; the fed is getting more and more involved in curriculum and even in the lesson plans. Teaching the bare minimum and curriculum geared towards proficiency testing in the public schools needs to be stopped! This almost makes me want to finish my teaching degree so I can get in and teach these children the way my generation was taught. I would put my punk rock roots to use and rise up against all the bureaucracy, political correctness, censorship and red tape! If a child can’t handle the red ink of correction, what chance will they have as an adult in the real world? This is what happens when LAWMAKERS decide they know what’s best for education, and parents decide they want to be “friends” to their child, instead of parents. Very frustrating for a teacher, and I’ve still got 18 years (at least) to go. Ugh!